2013 Sheldon, Grenache Blanc, Sonoma Coast. The last white from Sheldon Wines is their bright and tangy Grenache Blanc, this vintage is 100% Grenache Blanc, no Roussanne this time, and it is a stylish summer sipper all ready, though look for this white to age well and gain complexity over the next 2 to 3 years. This is exciting juice with unique white Rhone character and underlying elements, with vibrant flavors and plenty of crisp acidity. I tasted from barrel and now from finished bottle and really love this edition, it just feels complete, and it seems to be the wine they were always striving to make, it is lifting and elegant with plenty of panache. 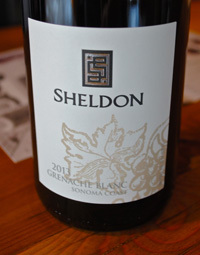 The 2013 Sheldon Grenache Blanc is pale with hints of gold and green hues, a touch of white flowers and briny notes along with citrus leading to a palate of fresh peach, honeydew, lemon and nectarine fruit with apricot flesh and stone/pit, almond oil and crunchy apple skin. The is mouth watering acidity, saline and savory notes along with a touch of river stones and this wine is tangy/brisk finishing with a slight bitter edge in it’s youth, making it super refreshing and vivid now, though it should gain with bottle age, it looks to need some time to fill out, and I think it should find a real happy place in another year or so that might show a improved roundness, and creamy texture that it only hints at now, even though I enjoy it as is and certainly admire it’s austere and zesty nature now, again it is a super wine and would go great with warm days and add benefits to summer cuisine, this is lovely hand crafted stuff.